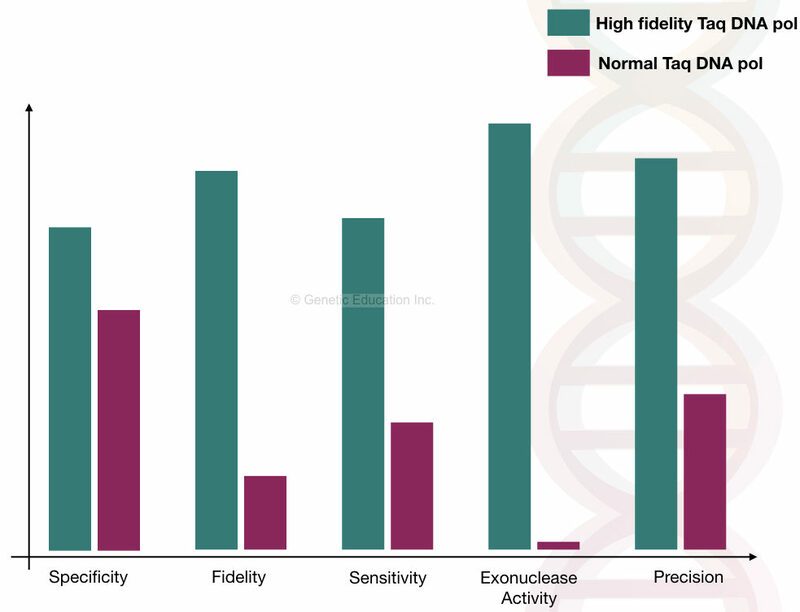 By using the high fidelity Taq DNA polymerase, DNA fragments of more than 10kb are efficiently amplified using the long-range PCR technique. PCR is the cyclic biochemical reaction in which the DNA of our interest amplified millions of times by using the dNTPs, PCR reaction buffer, DNA primers and template DNA because an interpretation of the result is not possible with the fewer copy of DNA. A conventional 25μL or 50μL reaction amplify only several basepairs of fragments. Efficiently up to 1500 to 1800bp fragment can be amplified into the conventional normal PCR reaction. However, amplification of longer DNA fragments such as 5kb, 10kb or 20kb DNA fragments is quite difficult with our normal PCR reaction. For long-range PCR, a higher concentration of reagents, long cycles with extended time and extreme precision and expertise is required. Further, special types of Taq DNA polymerase and some other PCR reaction enhancer are required. In this article, our major concern will be on the amplification of larger DNA and how to do it. In the denaturation step, at the 94 ̊C, the DNA template of our interest DNA denatured or break opens into two single-stranded DNA. In the next step, the extension period, the sequence-specific primers bind to the DNA between the temperature of the 55 ̊C to 65 ̊C (at its annealing temperature). After that, the amplified DNA is run on the agarose gel electrophoresis. Depending upon the requirement of the researcher different modification into the native PCR reaction can be done. For example, to achieve higher specificity into the reaction Nested PCR or Hot start PCR can be performed. For amplification of specific allele, allele-specific (ARMS) PCR can be performed. Long-range PCR is one of the modifications of the native PCR reaction in which the longer DNA template can be amplified efficiently. What is long range PCR? For amplifying the longer DNA fragments, extensive protocol setup optimised Taq DNA polymerase, PCR reaction buffer and primers are required to obtain a specific reaction. What is the need for the long-range PCR? We can identify the mutation and single gene disorders by conventional PCR, then why to do long-range PCR? Well, the answer depends on the requirement of the assay. Some of the mutation detection techniques depending on the fragment size of the DNA, For example, the Fragile X syndrome. The fragile X syndrome is a high GC rich CGG repeat-containing region of the X chromosome. By analysing the fragments of the DNA amplicon we can characterize disease condition, carrier condition and normal condition. However, the fragment of such a DNA is too long, we need a long PCR reaction. Several optimizations are required to achieve the amplification in the longer template DNA. We need a different type of Taq DNA polymerase, different types of primer and PCR reaction buffer. It has low fidelity, can add up to several nucleotides and do not have the proofreading activity. 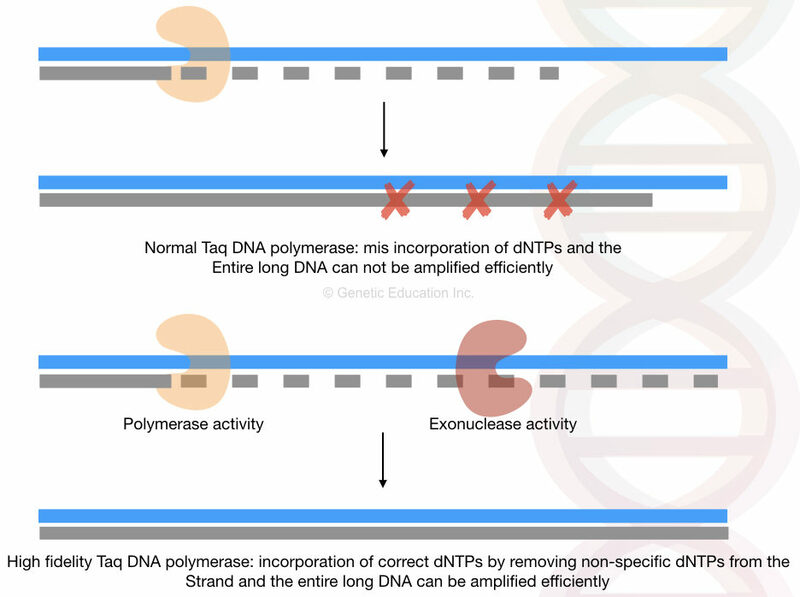 The routine Taq DNA polymerase can add dNTPs up to 1kb to 2kb, after that the chance of the incorporation of the wrong dNTPs are increased because the specificity of the Taq will gradually decrease. We need a Taq DNA polymerase having higher amplification rate, lower mismatch rate, high fidelity, efficiency and specificity. Importantly, the long-range PCR must have the 3′ to 5′ exonuclease activity. Instead of Taq, Tth and Vent have all these characteristics. The Tth and Vent have 3′ to 5′ exonuclease activity. Higher concentration of enzyme is required into the long-range PCR. Use a combination of two DNA polymerase one with high specificity in high concentration and one with the exonuclease activity in lower concentration. For the use of single high fidelity Taq DNA polymerase use 2.5 unit to 3.0 unit of concentration of the polymerase. If you are using the two different Taq DNA polymerase use 1.5 unit concentration of normal Taq and 0.5 to 1.0 unit for high fidelity exonuclease Taq polymerase. Along with the DNA polymerase, the primers used into the long-range PCR reaction must be unique and different than the normal PCR reaction. The primer must be 22 to 30 nucleotide long, contains 50% or more GC content, lower secondary structure and has annealing temperature between 58 ̊C to 68 ̊C. As per the requirement use 0.1 to 1.omM of primers. Ideally for the fragments up to 20kb use 100pM to 200pM of primer concentration. For the complex PCR template DNA use, low concentration of primers, For simple or lower complex template DNA uses a high concentration of primers. The reaction buffer concentration is even different for the long-range PCR. The PCR Reaction buffer must contain a high concentration of MgCl2. The PCR reaction buffer must contain 2mM to 5mM MgCl2. However, the concentration of magnesium ion depends on the purpose of our reaction because a higher concentration of reaction increases the non-specific bindings into the reaction. Also, we can use KCl, Tricin, DMSO and other chemicals as per the requirement of the reaction. However, for the long-range PCR, we personally recommended using the ready to use PCR reaction buffer for it. we are amplifying longer DNA fragment, which means we need a larger amount of each chemical and PCR template DNA into the reaction. Use up 500 ng to 1000ng template DNA into the long-range PCR. Also, the template DNA must be intact and highly pure otherwise the Taq cannot work efficiently over a period of time. The concentration of each component used in the PCR reaction is already given into the above section. If doing a long range with PCR buffer, use the concentration given into the article. After the completion of the PCR reaction, the PCR products are run on the 2% agarose gel electrophoresis. The specificity of the reaction increases by using the high fidelity Taq. It facilitates the amplification of longer DNA fragments and also the high GC rich regions. The rate of success is too low with customized protocols. The chance of misincorporation of dNTPs is also high. The technique is not suitable for routine use. Long-range PCR is the first choice for the diagnosis of long CpG repeat containing templates. Also, it can be useful in downstream application. However, highly purified template DNA and extensive experimental setups are required for the technique. Still, up to 20kb DNA fragments can be amplified with long-range PCR protocol.